Over the course of several million years, the brain that has co-evolved into the human brain alongside hands that have evolved into human hands. The parietal lobe in our brains is very large, and contains powerful special-purpose neural machinery to support dextrous manipulation with our hands and fingers. The entire rise of civilization itself can be linked to our steadily improved ability to make things with our hands. Oddly, our society has — at least temporarily — moved away from embodiment in its information technology. More and more we communicate with each other as abstractions, through simple swipes and taps on little glass screens that use only a fraction of our hands’ enormous expressiveness. The design industry now relies on such software packages products las AutoDesk’s Maya to create three dimensional forms, which force human creativity to be expressed through data tablets and touch-pads — poor substitutes for the vast expressive power of the human hand. At some point we will figure out how to reverse this trend toward disembodiment, and then we will get the best of both worlds. Perhaps one measure of the eventual success of our information technology will be the extent to which it lets us fully utilize these magnificent brains of ours, to do the sorts of things for which they have so exquisitely evolved. Today our lab was honored by a visit from Dr. Ikalu Taw’tute, developer of the antigravity drive on Pandora. 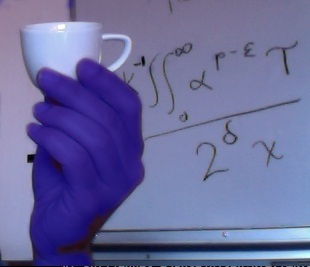 As you can see from the picture, his hands are rather large, though he did a very good job of holding one of our tiny Earth coffee cups. It turns out that the Na’vi very much enjoy coffee. Their body chemistry is different from ours, and caffeine actually relaxes them. Dr. Taw’tute was kind enough to write down for us, in our own mathematical symbols, the underlying principle behind his anti-grav drive. I noticed that they use τ rather than π in their mathematics, which is very civilized of them. Unfortunately, the last part of the equation is cut off in the photo, so you won’t be able to duplicate the drive. Unless, of course, you manage to get your hands on some unobtanium. Little kids watch the same movie over and over again, never getting bored. But the grown-up mind seems to require a different kind of stimulation. For adults, most movies become “used up” after the first viewing. Of course there are exceptions to this. For example, I can see Casablanca or Blade Runner endlessly and never get bored. But I can’t do that with most films. I suspect that eventually the technology will exist to allow filmmakers to create mutable films — movies that can end in different ways when you watch them multiple times. I’m not saying this will be easy, I’m just saying it will probably happen at some point in the future. Creating such multiverse movies will involve all sorts of techniques that either do not yet exist or are still in their infancy, such as accessible procedural narrative tools for authors, and a much better level of “digital actor” technology than we have today. When that day comes, I wonder whether people will look back on the movies from our time, with their unchanging plots, fixed character arcs and immutable outcomes, and perceive them in much the way we now regard silent films — as a fascinating yet quaint reminder of a vanished era. Here I am, safe and snug inside, listening to the howling winds and pounding rains of Hurricane Irene as it vents its fury. And I am reminded once again of the strange irony of storms. Ever since I was a child, I’ve loved to lie safe in my bed at night during a summer storm, seeing the flashes of lightning out my window, listening to the powerful crashes of thunder as they rolled majestically across the land. I used to marvel that the thunder sounded exactly like God bowling. The fiercer the storm, the louder the lashing rain against the window, the more I liked it. I think there was something about experiencing this while snug and warm in bed, protected by the powerful shield of my parents’ house, that made it clear how fortunate I was to be loved and safe and protected. I know that not everyone is as fortunate, and that by the time this day is done Hurricane Irene will have taken her victims, as hurricanes do. Yet as odd as it must seem, there is a part of me even now, listening to the ebb and flow of the raging storm, feeling the power of the elemental forces just outside my window, that journeys back to that time long ago, and becomes a child who is warm and safe, and loved. The other day I was in a conversation in which somebody wondered whether camera chips would keep increasing in resolution. After all, when you can already take a picture with 20 million pixels, why bother to go higher? At which point it occurred to me that an affordable sensor element with 100 million pixels, or even more, would be very useful. Not for taking pictures of higher resolution, but for changing the nature of cameras in a more fundamental way. If I had a sensor with a vast number of pixels, I would put an array of little lenses over it. with each lens having just a modest number of sensor elements behind it (say, a million or two). There are two important things about this scenario: The first is that each little lens is in a slightly different position. Those slight positional differences allow the camera to capture an entire lightfield. Once you have a lightfield, you can reconstruct the 3D shapes of things, or selectively kick various objects out of focus in software, or all sorts of other cool things you can’t do with a conventional camera. This is essentially the magic sauce behind the Stanford spinoff company Lytro. But the other cool thing about this scenario (and Lytro hasn’t figured this out yet, but they will soon, or else somebody else will), is that you can make a camera that’s totally flat, like a credit card. Because those tiny little lenses don’t need the long focal length of a big lens — they only need to be a small fraction of an inch in front of the sensor element. Just take that flat credit card out of your wallet, hold it up, and you can start capturing rich lightfields. This is both good news and bad news. The good news is that a whole new class of extremely cheap cameras which can capture reality far better than today’s cameras will be everywhere — on clothing, wallpaper, floor tiles, stick-on decals — anywhere there is a surface. The bad news? Well, reread that previous paragraph and think about the implications. The good news is the bad news. One odd thing about a hurricane is the fact that you know it’s coming. The city has emptied out. No flashlights are left in stores anywhere. The weather now, as it often is the day before a hurricane, is warm and calm and clear. Most memorable events sneak up on you, but not a hurricane. We pretty much know the general outline of what’s going to happen here — the howling winds, the unbelievable amount of rain that will fall in just one day. We know to stay indoors, to stock up on food and water, and to keep all the windows closed. Of course we don’t know where things will go wrong, or for whom. Most of us will be just fine, but some people will be unlucky — some more unlucky than others. Don’t get me wrong, we’re pretty fortunate here in New York. The worst of the storm is spending itself down in North Carolina, and up here we will get the diluted version. Two days until Hurricane Irene reaches New York City. It’s so strange that the only hurricane to hit this town in years comes on the heels of our first earthquake in years. It’s as though we are living through an age of signs and wonders. Next thing you know, it’s going to rain frogs. Although, this being New York, it will probably rain bagels. Which, come to think of it, would be rather nice. Once we got onto the subject of words, I started thinking about how words can be distinguished not by their meaning, but by their lexical form. For example, suppose we consider every word in the English language that, when its letter order is reversed, forms a different word. This evening I did a quick computer analysis, starting from a rather comprehensive word list. 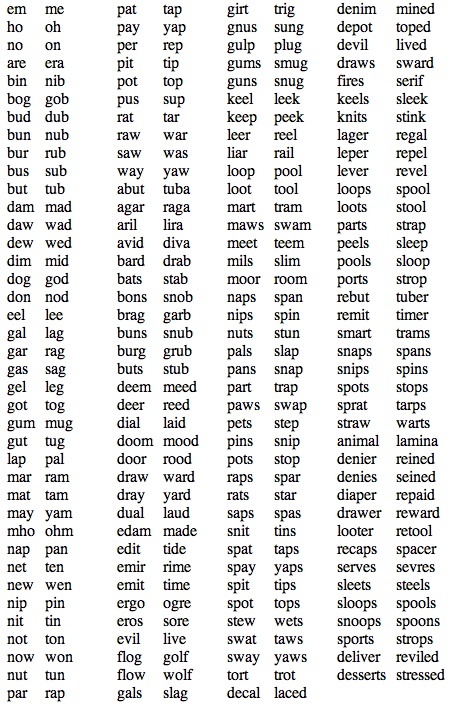 To my surprise, I found only 155 such pairs of words altogether (see below). Somehow I’d thought there would have been more. When Sharon suggested that I might be referring to a non-existent word — in this case “apological” — I rushed to defend my word suggestion, going so far as to find a reference to it in a dictionary. But perhaps I am wrong to have been so defensive. After all, Shakespeare himself coined literally thousands of new words, including (it is generally believed): abstemious, accommodation, addiction, aerial, arch-villian, auspicious, bedazzled, belongings, birthplace, bloodstained, bottled, coldhearted, countless, dauntless, dishearten, distasteful, droplet, employer, enrapt, enthroned, eventful, eyeball, fashionable, fitful, flowery, freezing, impartial, inauspicious, lackluster, laughable, lustrous, mimic, moonbeam, motionless, noiseless, perplex, quarrelsome, satisfying, scrubbed, silliness, time-honored, unchanging, uncomfortable, unearthly, unmitigated and well-read. So perhaps I should be sad that “apological” already exists. After all, no language was ever harmed by a little neologism. An observant comment on yesterday’s post pointed out the link from the Kwalado to Myron Krueger’s creature. In fact the Kwalado has a long and proud lineage, dating very far back. Some of her recent ancestors include Peter Lord’s character Morph (1977), the Id Monster from Forbidden Planet (1956), the intrepid hero of Chuck Jones’ Duck Amuck (1953), and all the little playthings that provided such innocent amusement for Chernabog in Fantasia (1940). Not to mention just about everything from the early career of Art Clokey. Scientists have recently discovered that in addition to the well known geological eras of the Pliocene, the Pleistocene and the Holocene, there was another, lesser known era, when primordial creatures of indeterminate morphology roamed the Earth. I speak, of course, of the Plasticene. It wasn’t always thus. There was a time when all creatures were determinate in form. Then came the cataclysmic occurrence that geologists refer to as the “Plasticene explosion”. Nobody is quite sure why the Plasticene era occurred when it did, yet arguably it brought about the most significant apological transformation in geological history. The Kwalado knows nothing of this. She is all too easily upset, and usually prefers not to dwell on the past. If I were you, I wouldn’t say anything to her about it. You are currently browsing the Ken’s Blog blog archives for August, 2011.